Want to help kids improve focus, sleep patterns and mood? There is no shortage of research and information on mindfulness and its benefits both in scholarly articles and in health and fitness publications, and many are focusing on the value of mindfulness for kids. As it turns out, kids too can reap the positive mental and physical health benefits of being mindful. In today's increasingly demanding and fast-paced society, kids face higher levels of stress at younger ages. With a plethora of distractions, many children are losing their ability to focus and have shorter attention spans. Mindfulness—the idea of encouraging a calmer, more present mental state by focusing awareness on the present moment, feelings, thoughts, breath and bodily sensations—can be a hard enough concept for most adults to grasp, and expecting kids to understand it may seem like a stretch. However, since children don't have as many hard-wired behavioral and mental patterns as adults do, kids are like blank canvases. They can easily learn and adapt to new behaviors and ways of thinking. Which means that mindful techniques can be easier for them to learn and practice. Kids who practice being mindful can experience improvements in attention span, concentration and learning. This re-focused mental state can also have positive effects on physical health, emotional and social well-being, as well as sleep quality. Kids learn by example, so taking the time to practice mindfulness with children for a few minutes a day will encourage better habits that both the parent and child will appreciate. In the end, everyone will reap the benefits for years to come. With kids it's best to keep it simple. Breathing, balancing and stretching are all great ways for kids to practice being mindful. Try standing or lying down on the Eco Mat for Kids and taking a few deep breaths. 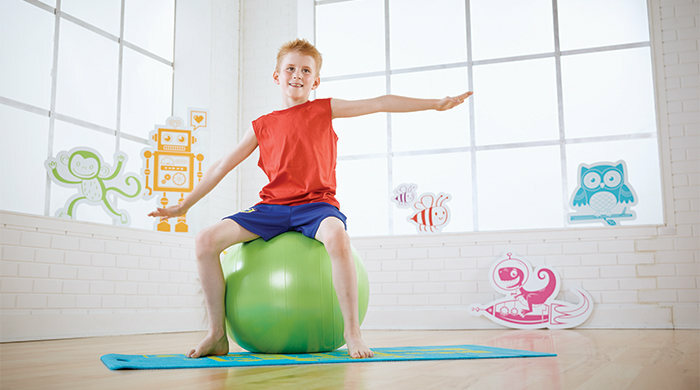 Have the child sit on the Stability Ball™ for Kids and encourage them to concentrate on balance as they lift up one leg at a time. Another great exercise option is to place one hand on the Yoga Block for Kids to support the child through a seated side stretch, which also improves flexibility. Interested in learning more about mindful movement kid-friendly exercises? Check out our Fitness Fun Pilates for Kids DVD.